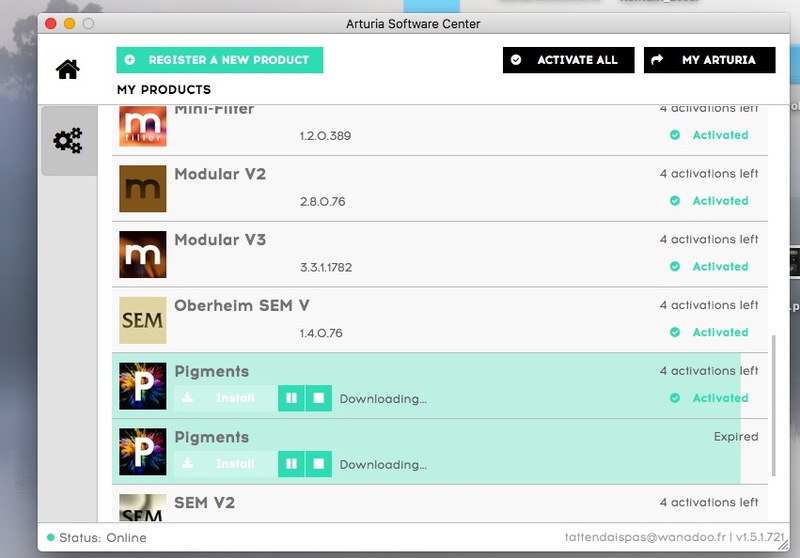 I purchased Pigments, and activated it on the install I already had from the Trial license. The Trial license, even though expired now, remains in ASC. I want to get that out of there, because it's confusing and annoying. How do I de-register this Trial license from my account, so that it no longer shows up in ASC? Should be able to remove the trial licence. For me it was different ... I‘m on mac OS ... don‘t know if that might play any role. When I installed Pigmets‘ demo it didn‘t show as a demo in ASC, but as a full version. When I started it, it showed the demo „x days left“ notification. Then when I bought it bundled with V Collection, the next strange thing happened ...on the invoice I saw only VC, no word about Pigments. But when I recieved my mail with the serial numer, I had a second one for Pigments. Nothing else changed, except that the „x days left“ vanished after starting Pigments again. So I didn‘t reinstall and saw no changes in ASC ...Pigments is listed there as before. It‘s also listed as registered under „My Products“ on the website now. Have any of you who have this issue tried to uninstall your trial versions? You may have installed Pigments twice somehow or similar so some trial informations is not deleted or overwritten. If you only have one version, then a un- and reinstall of that might help. Perhaps it's best to restart you computer after the uninstall. At some point, the Free trial license will be automatically removed from your account. Uninstall / re-install the instrument won't have any effect. I‘m on High Sierra and see only one Pigments entry in ASC. And the two versions are also on my Arturia account . I would open a support ticket then. Solved for my account and in Arturia Software Center .